OXFORD, Miss. 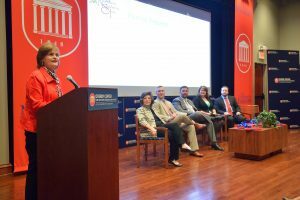 – The University of Mississippi Department of Nutrition and Hospitality Management recently gave students and alumni a new perspective on the industry through its annual Global Leadership through Service Symposium. The idea for the annual leadership symposium arose five years ago from the work of Mary Roseman, associate professor of nutrition and hospitality management and director of the NHM program, and her team, Yunhee Chang, associate professor of NMH, and Candis Varnell, lecturer and internship director for the program. “The vision of the leadership symposium is to advance the image and exposure of trending hospitality and nutrition professions to UM’s academic community in order to broaden the perspectives of students, alums and academics through engaging presentations by impressive regional and national speakers from the nutrition and hospitality industry,” Roseman said. This year’s symposium featured a panel from Nutrition Systems Inc., headquartered in Jackson and owned by two Ole Miss NHM graduates, Lynn Carpenter Moore and Elise Smith. Moore and Smith joined Nutrition Systems senior staff members Brad Boudreaux, Brady Taylor, Jack Warner and Heather White on the symposium’s panel March 30 to address more than 140 students, faculty and staff in the Overby Center auditorium. The panel discussed topics such as the application of dietetics, hospitality management, culinary service, marketing of a professional business model, recognition of team-building dynamics’ the power of networking in business growth and entrepreneurial opportunities for a profession. One of the primary messages at the session was the necessity to establish and maintain relationships. The department tries to bring representatives of a national or regional business in the industry to speak at the symposium each year, Roseman said. The goal is to spotlight the growing opportunities in these two fields, she said.